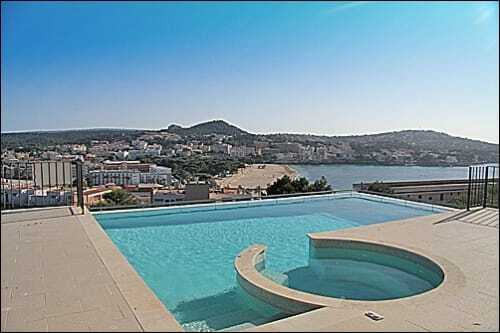 Excellent villa in a prime location in Nova Santa Ponsa, Mallorca. The property features a plot of 853 sqm at a slightly elevated position, which provides views over the surrounding landscape. The 2-storey house has 248 sqm of living area and includes a large open-plan lounge with a modern kitchen, an office room, 4 bedrooms and 3 bathrooms. A spacious porch is practically designed for outdoor dining and the chill out corner is perfect for relaxing during the hot summer days. The large swimming pool with Roman steps is surrounded by a spacious sun terrace and an outdoor shower. There is another open terrace on the first floor with nice views across the valley to the mountains. The villa is partially furnished and equipped with an air conditioning, central heating (gas) and a fireplace. The territory is fully gated and there is a parking place in the garage. This villa is within easy reach of Santa Ponsa, a vibrant tourist resort with two fine sandy beaches, bars, restaurants, yacht club, schools and sports facilities. In a few minutes you can also get to luxury marina of Port Adriano with a variety of gourmet restaurants, boutiques and a shopping area.